Extra covers for the MedCline Therapeutic Body Pillow purchased here will fit MedCline systems purchased after 3/1/2017. 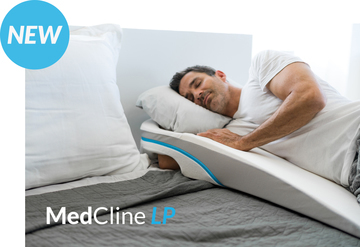 If you purchased your MedCline prior to this date or have any questions, please call us directly at 800-610-1607.
shoulder and the reflux pain NOOO MORE!!!! Going on one year. Enjoy it immensely. Came to site today to order pillow cover. I see wedge covers are now available. Sleeping on the wedge pillow combination gives me a sleeping comfort only previously experienced at the Wynn Hotel, Las Vegas. I find my best position is sleeping on my left side, with my right hand tucked onto the opening. Best thing I've ever done for myself. ! Didn't need the wedge since I have an adjustable bed but I am so hooked on my pillow. I've NEVER slept so well and I've spent just as much on a regular pillow. Love the way it cradles me and it's cool ,soft and easily adjustable to my every position. I've never been so pleased with any product. I love it and recommend it to anyone. I've tossed and turned my entire life but now I sleep cozy and cradled all night long. So very helpful in getting a better nights sleep! 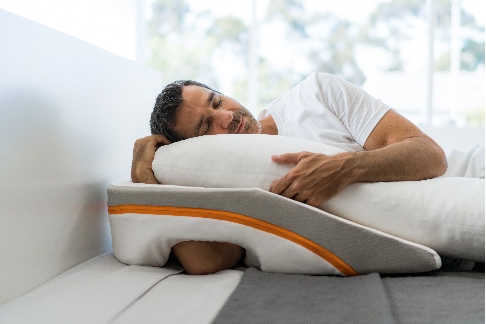 The Medcline pillow system has dramatically improved the quality of my sleep and I give it top marks for the workmanship and attention to detail they've put into this product!